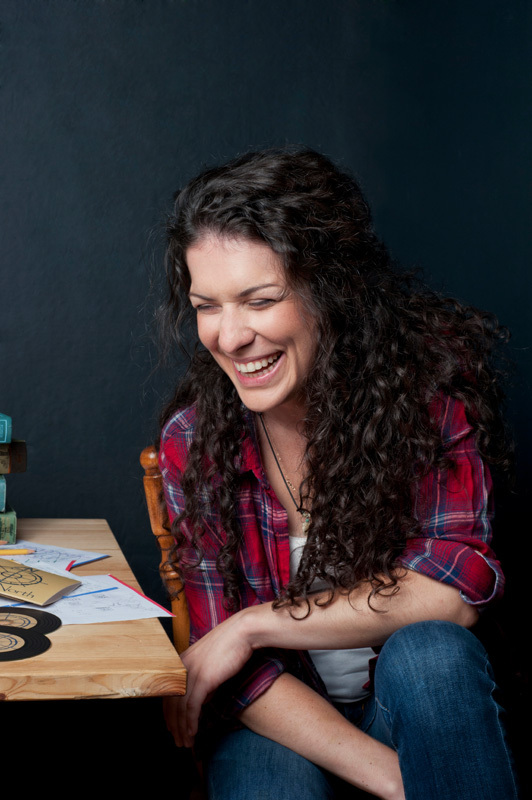 “Leaving is a must, staying is a should.” That’s one of Jess Hofmann’s lyrics, encapsulating how she felt about a recent shift she made in her life, from full-time first grade teacher at Folger McKinsey Elementary School in Severna Park to full-time singer/songwriter. Though devoted to the six- and seven-year-olds she taught, describing them as “a group of people that couldn’t be more honest and genuine,” Hofmann was fearful that life was becoming a little too robotic. Moreover, her passion for writing and singing songs was taking too much of a back seat to her teaching. She was playing nighttime gigs only when she could, and writing songs when she wasn’t too exhausted from the school day. Jessie photographed with her lyrics drafts and band cds. So, after three years of dealing with tears and shoelaces and noses, 26-year-old Hofmann was ready to make the leap. “I want[ed] to take the time to see what I could do while I still could,” she says of the difficult decision she made roughly a year and a half ago to quit her teaching job to play music. A remarkable thing, considering the self-described introvert suffers from extreme stage fright, at times breaking down and leaving the stage when she first started performing. “I just love it so much, though, that I’ve forced myself to do it. I think I just wanted to share the music, and that’s what kept me going,” she says. Ever since the Crownsville native was a teenager she’s been drawn to live music, whether it be by sneaking into music venues or by forcing herself to play open mic nights despite her nerves. “I love everything about it. It just makes me feel so much. There’s this feeling in my chest . . . full of emotion, and nothing else can give me that.” When her father gave her older sister a guitar, when Hofmann was in the eighth grade, it was Hofmann who picked it up and started to play, accompanying herself as she sang. She has since expanded her musical talents. In addition to being a solo artist under the name of Jess Marie, she formed a band, Amber North, with Jason Kearse on drums and piano and his brother Johnnie Kearse III on bass. 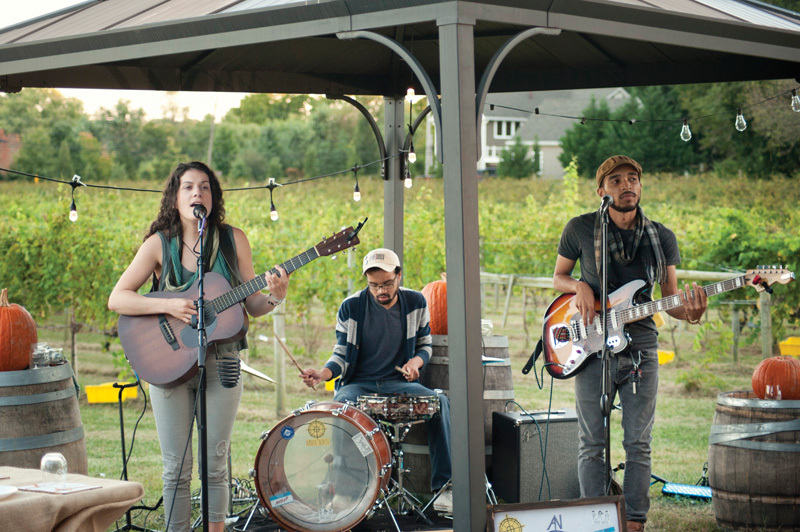 Self-described as having a “soulgrass” sound, the band plays a unique combination of indie, folk, and soul—fitting for Hofmann, who claims she has “music ADD.” Amber North was born out of a spontaneous jam session on New Year’s Day 2016, after the members met through mutual Baltimore-based friends. When not practicing or writing songs, they perform three to four gigs a week. 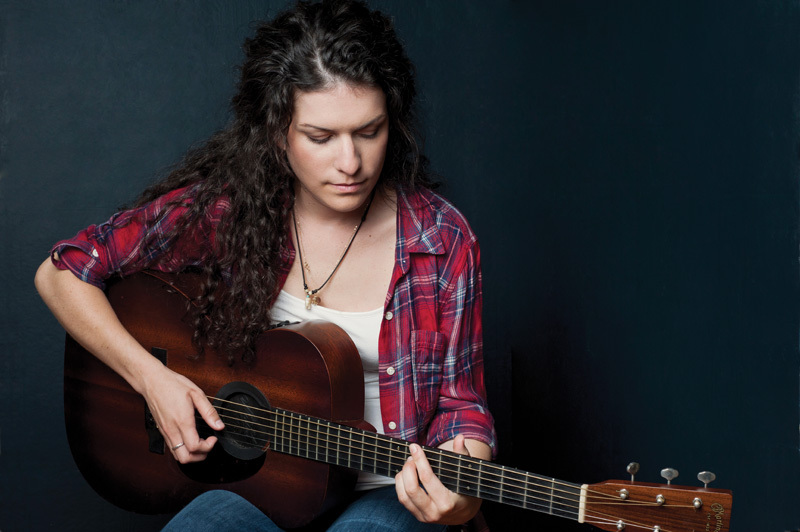 “Playing music is just what I feel like I was supposed to do,” she says. Still, Hofmann has not strayed far from teaching, continuing to sub a few days a week or as needed at Folger McKinsey and other Anne Arundel County schools. She maintains close ties with her former colleagues, one of whom rents a room to Hofmann out of her house. Hofmann credits Rachel McWilliams and her husband, Mark, for much of her success. “None of this would have been possible without them.” They provide Hofmann with not only an affordable place to live but also abundant support and encouragement for her burgeoning career as an artist. Jessie and her band playing a 3-hour show at Great Frogs Winery in Annapolis. Staying connected to the teaching world while pursuing music will always be important to Hofmann. She was originally drawn to the classroom after finding a certain solace in it during elementary school, when her parents were going through a difficult divorce. “School became my only escape . . . where I could turn it all off for a while and pretend everything was good. I wanted to create that escape for someone else, or I guess lots of little someones,” she says. Not only did Hofmann create that safe, nurturing place for her students, but she also got something equally meaningful in return: “There’s something about the relationships that form when you’re in a room with the same group of children all day, every day,” she says. “I feel like you become a family.” Not so unlike the family that she’s formed with her fellow bandmates. On a recent Friday night at Fado Irish Pub, one of Amber North’s occasional gigging spots, the place is packed. In the middle of the bar, Hofmann sits cross-legged on a stool, her guitar gracefully balanced on one knee as she breaks through the sloppy bar clatter with a voice that is at once delicate and powerful. The band’s harmonies are pitch-perfect and chilling, and the bass, drums, and piano together create a sound that is natural and organic— even while fighting off colds—as they play everything from Johnny Cash to Alanis Morrisette to Vance Joy. When not playing covers, Amber North creates and performs original work, hoping to start recording its first album this winter. When asked where Hofmann’s songs come from, she is her characteristically modest self: “I wish I was one of those cool songwriters that was a storyteller about other people’s lives. But it’s basically my diary . . . of course, some stuff is exaggerated . . . but it’s pretty much my experiences.” Those experiences range from quitting her job to traveling to Thailand to challenging stereotypes about being a woman. Jessie playing a 3-hour set with her band Amber North at Great Frogs Winery in Annapolis. Jessie playing live with her band Amber North at Great Frogs Winery in Annapolis. Jessie playing a 3 hour set with her band Amber North at Great Frogs Winery in Annapolis. Jessie photographed with her lyrics drafts. Jessie playing her guitar in the studio. Jessie photographed with musical instruments and lyrics sheets. Jessie photographed with her guitar in the studio. Jessie photographed in a favorite performance dress in the studio. Jessie photographed with musical instruments and incentives for her students. Error: Error validating access token: Session has expired on Saturday, 09-Mar-19 15:57:50 PST. The current time is Tuesday, 23-Apr-19 08:53:57 PDT.